2. Elizabeth (1807-1865) b & r. Somerset Co.
3. John N. (1810-1892) b & r. Somerset Co. (m. Mary Lohr; Farmer) his son, Benjamin F. Bowman, wagonmaker and Civil War vet is often confused with our Benjamin. They were cousins. -burial: possible Bowman-Shaffer farm cemetery, Quemahoning Twp. -buried: Husband Cemetery, Somerset, PA. His son Dr. Jacob T. Bowman founded the Somerset Community Hospital in 1927. * The History of Bedford, Somerset, & Fulton Counties, PA (1884) has Peter Bowman as living and dying in Quemahoning Township, the only son of John S. Bowman, a native of Germany. The Biographical Review Containing Life Sketches of Leading Citizens of Bedford & Somerset Counties, Pennsylvania (1889) V. 23, pp. 208-210, has Peter’s father as John J. Bowman (b. 1847), son of John & Mary Lohr Bowman, of Quemahoning Township. Peter’s paternal grandfather was Stephen was born in Germany and lived in Western Virginia. 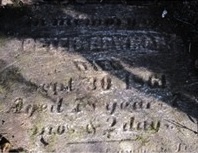 This Peter was born in VA in 1783 before moving to Quemahoning Township. Confusion among the various Johns, Jacobs, and Peters still reigns. @ Several siblings died in 1884. Could this have been an epidemic? # Some sources list a Thomas with these dates. Could Jacob and/or Franklin have been a middle name? I was aimlessly searching the internet and came across this great website! I noticed you have William Bowman with no info. He is my G G Grandfather. He married Sarah Woy of Somerset and had “x” children. They moved to Johnstown, PA, where we still currently live, (about 20 miles from Somerset.) However, William and Sarah are buried in the Husband Cemetery in Somerset. He died in 1920, She in 1924. His son, Dr. Jacob Bowman (b.1882) started the Somerset Hospital. My G Grandfather, Jacob’s older brother, Irvin, remained in Johnstown and became the owner of a pattern making concern tied in with the Cambria Iron/Steel Company . He and my GGrandmother are buried in Grandview Cemetery. Along with my Grandmother and Grandfather, Clarence S. Bowman.